Recently when viewing the recent release of Pirates of the Caribbean: On Stranger Tides, I realized how mousey of a movie this latest installment truly is. Let’s be honest, it could be easy for a movie based on a ride which had then lead to changes within that ride to drift away from its Disneyness, yeah I just made that up. Let’s be honest, the producers and directors at this point have established something that can be an financial success without ties back to the Disney parks. 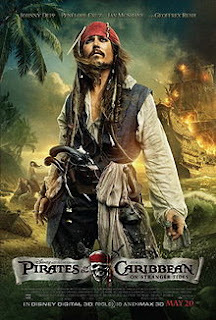 Instead I found a film that not only would Pirates movie fans enjoy as they follow the latest adventure of Captain Jack Sparrow, but Disney fans in general. The following are my favorite Mousey Movie moments. · Dame Judi Dench: The great actress has a brief encounter as a high society lady in a carriage with Captain Jack Sparrow. This scene instantly made me think of Spaceship Earth and I was pleasantly surprised that a Pirates installment made me think of Epcot. The addition of the current narrator of this classic ride may not have been done intentionally to link us to the parks, but it put me there. 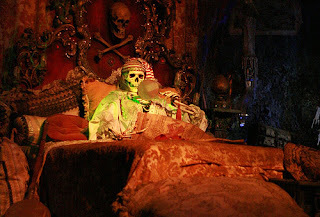 · Ponce de Leon’s Bedroom: Captain Jack has to recover two chalices from the wreck of Ponce de Leon’s ship the Santiago. The bedroom in which Ponce de Leon’s remains and the chalices reside is almost a direct lift from the Pirates of the Caribbean ride at the Disneyland Resort. Viewers find a skeleton reading a map surrounding by treasure. When I saw this scene I asked myself, hey am I in Anaheim? · Water that defies gravity: At one point Captain Jack observes gravity defying water. Clearly this water could only be created by the laminar jumping fountains of Epcot. Okay I may be pushing it here, but I found it funny that the idea popped into my head while watching the water float up. I guess in the end that’s where my comparison fails. This water floats, the laminar fountains are more lively! · “It’s a Pirate’s Life for Me!”: When asked about his goals, Captain Jack answers with this classic line from the attraction theme. This one line for me is enough to say that Captain Jack Sparrow is firmly part of the Disney character family. And I have to be honest; when the first movie came out I had my doubts that this would ever be true. Captain Jack Sparrow has firmly placed himself within the Disney universe, and this latest Mousey Pirates movie only reinforces this fact.